WARNING! The following blog contains a photo of me first thing in the morning. Turn away if you’re easily offended by flannel shirts, mismatched pajamas, and bed head. The thing is, the old me would never have put such a photo out there. The new me, the one working through the “What will people think?” issue, is pretty sure no one gives a goshdarn if I wear makeup or not. 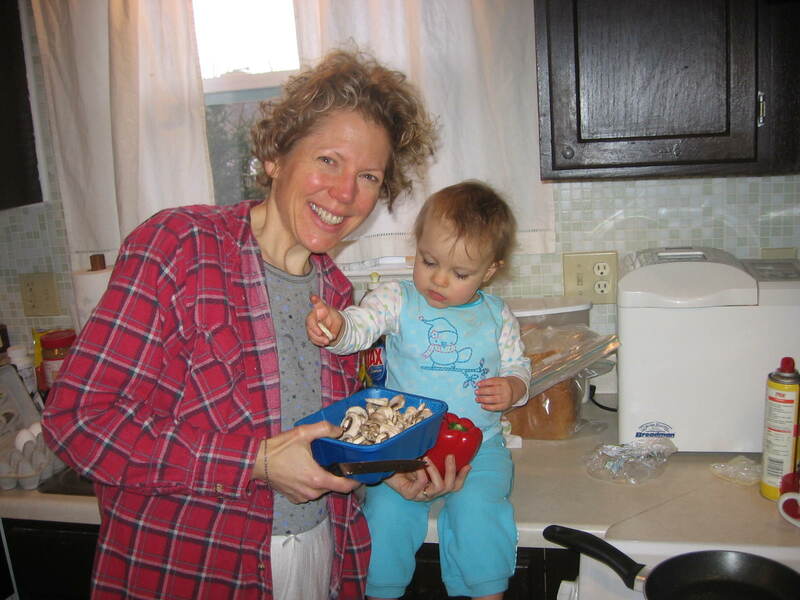 The first time Claire and I cooked together, she was 3 months old. I’d laid her in her mother’s sling and wrapped it around my neck and shoulder then went in the kitchen and made an omelet. Claire couldn’t help much, but still I talked to her about the foods I was chopping and cooking. She didn’t cry so I took that as a good sign. The older Claire got, the more curious she was about what Grammy Lynn was doing in the kitchen. “Unh! Unh!” she’d say, pulling at my leg and bouncing a little with her arms in the air. In other words, “Pick me up, NOW!” When she weighed less than 20 pounds, it wasn’t too hard cooking with one arm (here we are making Christmas brunch) and she fit on my hip. But she’s at a size now where I can’t hold her and cook at the same time. When I was at her house yesterday morning, I knew as soon as she heard me digging out the fry pans, she’d be there like a shot wanting to know what I was doing and insisting she be picked up. Hmmmmm…what to do, what to do. God knows the word “No” isn’t in my vocabulary when it comes to that baby. “Wow” is Claire’s favorite word. Everything her little 16-month-old eyes perceive as fun is “wow”: things that make noise, glitter, have pockets, flip open, snap shut…you get the picture. She purses her lips and her eyes get really big and then she draws out the word long and dramatic in her throaty little voice: “Oooooowoooowwww.” So apparently my solution to the “Claire wants to help Grammy in the kitchen” dilemma was a hit when she said, “Oooooowoooowwww” after I picked her up and set her on the kitchen counter next to me and handed her a red pepper. She sat there patiently and attentively for 15 minutes while I – I mean we – made an omelet. As she held the red pepper (“Oooooowowww…”) she picked at the little price sticker. Big help! She held the jar of minced garlic for me (well, she shook and shook the jar of minced garlic) until she discovered that mushrooms were much more fun to touch (“Oooooowoooowwww…”). She even handed me the can of Pam when I needed it. What can I say? The kid is brilliant. When we were done, we sat down on a stool on the other side of the counter and ate our omelet. Claire loves eggs. She isn’t crazy for Swiss cheese, but she likes spinach. I suspect she’ll continue to like spinach until some kid tells her it’s gross. Isn’t that how many of our food aversions originated? It made me wonder, when did being busy become an excuse to feed kids Happy Meals? This is a legitimate question and not some kind of McDonald’s bashing because I was guilty of it back in the day, too. But I’ve since learned that making something healthy at home can be just as quick as going through the drive-through. It takes less than a minute to throw some turkey, cheese, tomato and lettuce on a wrap before running out the door; less than a minute to grab a handful of carrots and put a couple tablespoons of low-fat salad dressing in a Tupperware container to eat in the car. I’d love it if Claire never ate a french fry, but I know that’s not reality. And I’m not saying all fast food is bad or that kids should never be offered a treat. But maybe by continually exposing her to healthy foods and making cooking fun, Claire will opt more often for the broccoli or the apple or the turkey wrap. Please don’t think me the Tyrannical Food Grammy. I’ve already got big plans for making Christmas cookies with Claire this year. But more often than not, we’ll be cooking up the healthy stuff and having a lot of “Oooooowooooowwwww” fun. Who knows? Maybe some day Claire and I will have our own cooking show. This entry was posted in Uncategorized on February 26, 2009 by Lynn Haraldson. you will love this – I used to put a DRY, high sided dish pan in one side of the sink – and set my toddlers IN it. then I did all of my sink and counter work – standing right in front of the sink and using the water on the other half the sink. I gave them all kinds of stuff – measuring cups, etc to hand to me as I needed them. they were up at eye/hand level and in on the action. I too was a sling person – carried each one of my kids until they hit about 25 lbs in their sling. I had an old one for the pool – my kids were IN as babies – and sling was perfect way of keeping baby’s head above water while I tended to other kids. As you might guess – my kids were all very early swimmers! That’s cute. That made me think of my own kids and how they are when I make anything. Kids are such blessings aren’t they! And by the way, that picture is great! That is a wonderful photo (both photos) of you and Claire, I love how fun they look! My children won’t eat McDonald’s food and my son if offered a choice between fries and veggies will usually opt for veggies (or fruit especially if offered…he’s 10). What fun kids are. Wonderful story of sharing yourself with your granddaugher. I love the image of her wowing over the texture of a mushroom. Bet she grows up liking to cook!